The nation’s number two telco Optus has defended its investment in Tasmania after the revelation that a number of the sites it announced yesterday would shortly receive 3G mobile coverage in the state were first earmarked for network rollouts back in 2008. The telco yesterday announced a $25 million investment in Tasmania, noting over 45 towns, “for the first time”, would have a choice between mobile network providers — they previously only had access to the infrastructure of Telstra. However, a number of towns listed as receiving Optus mobile coverage — Bridport, Queenstown, Scottsdale, St Helens, St Mary’s and Zeehan — were also listed in a similarly worded 2008 media release (PDF), which announced a nationwide investment of $315 million. However, despite the re-run of the 2008 announcement, some Tasmanians are still positive about the growing amount of telecommunications competition in the state. Vodafone is believed to be running a distant third in terms of the number of base stations it owns in the Apple Isle, but Optus is gradually catching up to Telstra. Andrew Connor, a spokesperson for technology advocacy group Digital Tasmania, said in actual fact many of the Optus sites announced this week had already been rolled out over the past couple of years, with the remainder to flow in the short term. “It’s a massive win for consumers, especially those who have had no choice,” he said. In the town of Scottsdale, Connor pointed out, only a short while ago residents and businesses had only had access to Telstra mobile coverage and Telstra fixed line broadband based on its copper network. Now it would have both Optus mobile coverage and National Broadband Network fibre. Also, Andrew neglects to mention that a lot of the sites have been delayed to some degree or other due to local councils knocking back development applications, in more than one case AGAINST the recommendations of their town planners, etc. Seriously? That is just bizarre … why would a local council be against a mobile tower? I guess they can be unsightly … in Sydney I don’t really notice them. Me, me, me… all about Renai. I just did a google news search for “mobile tower rejected”, top of the list an article from a week ago regarding a Telstra tower at Quakers Hill. The FUD (oh my, my kids are going to grow an extra head) in that article is one of the major setbacks for mobile rollouts. It’s a Catch 22, people demand the coverage, but they also demand no towers. Femtocells could help with this problem. No tower required. Picocells, but I know what you meant. Just for reference I took a closer look at that article. A quick look at their website shows they sell safety kits and training for EMR, basically it’s their job to make people be scared of EMR otherwise they would have nothing to sell, ie. they are an unreliable source for valid information on EMR. Oh and their “Domestic” page tries to prove their point by using a TT article ..
Thx for the addition Warren, some sites sure have had a long gestation. 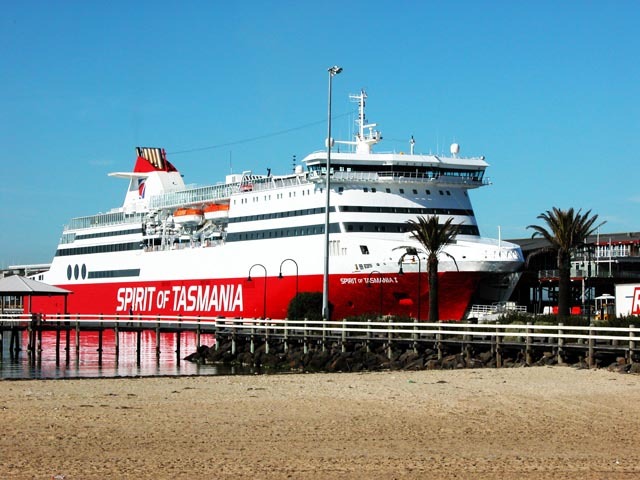 Nice choice of pic Renai… both ferries have a cell-repeater (or similar) providing service with one operator for most if not all of the voyage between Melbourne and Devonport. Towers in Tassie typically puncture the skyline on hilltops or kinda high above the surrounding towns/burbs to gain greater coverage… rather than (what I’ve seen of) cellsites in Sydney which are building mounted or low monopoles covering smaller areas to increase usable spectrum. Optus’ rollout in Tas has consisted mainly of 40-60m lattice towers in rural areas. So I wasn’t going mad when I thought yesterday that I thought I’d heard this announcement before…?